Background and objectives: Dental caries is a multifactorial disease involving interplay of numerous factors such as salivary Streptococcus mutans, flow rate, buffer capacity, pH etc. Hence any therapeutic agent influencing these parameters can be effectively used to interrupt the dental caries process. Thus the present study was conducted to determine the effect of mouthrinse formulated from ethanol extract of Terminalia chebula fruit on salivary parameters. Materials & Method: Ethanol extract of Terminalia chebula fruit was used to formulate the mouthrinse. Sixty randomly selected children participated in the study. Salivary parameters were assessed at baseline, and at various intervals post rinsing. Data was analyzed using ANCOVA and Wilcoxon matched pairs test. Results: No significant variation was observed in the salivary parameters between the two groups at baseline and 5 minutes postrinsing. There was an increase of 5.7%, 4.69%, 3.39% in salivary flow rate, pH and buffer capacity respectively in the study group at 60 minutes as compared to baseline values. Conclusions: Mouthrinse of Ethanol extract of Terminalia chebula has a significant effect on salivary parameters which can help counter the demineralization process. Objective: To assess the acceptability and survival of ART restorations on one surface carious lesions in permanent dentition among 12-13 year old government school children in Bangalore City, India. Materials & Method: A total of 181 ART restorations were placed using hand mix glass ionomer (Fuji IX) at the school premises following standard procedures. The acceptability was assessed by the presence or absence of pain or discomfort, post operative sensitivity and willingness to undergo the same type of treatment again. Evaluations of the ART restorations were done at 6,12 and 18 months. Results: Ninety one percent of children indicated that they did not feel any pain / discomfort during the procedure and 88.8% were willing to undergo the treatment again. The results of Actuarial Life-Table analysis showed that 83.7%, 76.1% and 68.7% of ART restoration survived at 6,12 and 18 months, respectively. Conclusions: Though the acceptability of ART procedure was found to be high, the survival was low. Aim: To assess the relationship between caries experience and body mass index among 5-15 year old schoolchildren of Piparia High school, Piparia Vadodara district, Guj arat. Materials & Method: Across sectional study was conducted among 167,5-15 year old school children of Piparia High school, Piparia, Vadodara district, Gujarat. To detect caries, WHO modified DMFT/dft index was used. The body mass index (BMI = body weight / body height2 (kg/m2) was used to determine weight category. Data was analyzed by SPSS version 14. Tukey's Post Hoc test at 5% level of significance was applied to compare statistically significant difference in BMI & DMFT/dft values. Results: Out of 167 study subjects, 5 (3 %) were having primary dentition, 57 (34.1%) with mixed dentition and 105 (62.9%) with permanent dentition. There was no statistically significant difference in the mean DMFT/dft values among subjects with different BMI categories. (p=0.477, 0.792 & 0.879 for DMFT andiM).757 & 0.102 for dft). Conclusions: There was no association between BMI and DMFT/dft values. As a part of health care team, dentist and dental students should be exposed to the changing demographics and sequel of obesity in children. Introduction: The prevalence of aggressive periodontitis (AP) has been extensively studied globally. Limited information is available on the AP prevalence in the Indian population. Hence a survey of the susceptible students of educational institutions in villages around Vikarabad, Andhra Pradesh, India, was undertaken to give a more accurate prevalence of aggressive periodontitis in the population and relevant preventive and remedial measures could be taken. Materials & Method: A total o f9600 subjects were screened to estimate the prevalence of AP. Subjects with loss of attachment > 4mm were recalled to Department of Periodontics, Sri Sai College of Dental Surgery, Vikarabad for clinical and radiological confirmation. Results: From 9,600 students screened, 15 cases (LAP- 9, GAP-6) were found to be confirming to the diagnosis of AP, giving aprevalence of 0.16%. Conclusions: The prevalence rate of AP in the screened population is 0.16% and is similar to other prevalence studies in Andhra Pradesh and in consonance with several other global studies. The prevalence of aggressive periodontits is highly variable and controversial globally and needs concerted and systemic approach if this is to be settled. Aim: To evaluate two short term anxiety rating scales, Facial Image Scale (FIS) and Venham Picture Test, (VPT) that have been used to assess anxiety in children before dental treatment. Materials & Method: Fifty two children aged 6-12 years, who visited the Pediatric Dentistry Department for the first time and whose parents/guardians agreed to take part were included in the study. Anxiety of children was measured on both FIS and VPT scales while they were waiting for treatment in the waiting room. Results: A weak correlation was found between the Facial Image Scale (FIS) and the Venham Picture Test(VPT). (r = 0.087, n = 52 ,p> 0.05) however, the mean anxiety ratings of the two scales did not differ significantly. (t=0.660,/΋>0.05). Conclusions: The findings suggested that both the scales are valid means of assessing child dental anxiety in a clinical context. Background: Malocclusion is misalignment of teeth and /or incorrect relation between the teeth of the dental arches. It leads to various unfavorable psychological and social sequelae. The concept of early diagnosis of malocclusion plays a very important role in identifying the disease and performing the treatment. Objectives: To assess the prevalence and severity of malocclusion and to determine orthodontic treatment needs among 13-15 year old school children inNellore district of Andhra Pradesh. Materials & Method: A descriptive cross sectional study was undertaken among a total of 2126 school children aged 13-15 years. Dental Aesthetic Index was used to assess malocclusion. Results: About 50.8% of them had dental appearance for whom orthodontic treatment need was 'slight' or 'not indicated and one third of them (31%) needed elective treatment. The rest of the children had dental appearance varying from severe to handicapping malocclusion for whom treatment was highly desirable (10.2%) or mandatory (8%). Conclusions: Forty nine percent of adolescents from Nellore district of Andhra Pradesh were in need of orthodontic treatment for dental health reasons. Among the components of Dental Aesthetic Index, incisal segment crowding was mainly responsible for allocating subjects into the group of malocclusion and orthodontic treatment need. The importance in having this data is in influencing policy makers and government officials to design health education programs and preventive orthodontic treatment programs. Introduction: The changing doctor-patient relationship and commercialization of modem medical practice has affected the practice of medicine. The fundamental values of medicine insist that the doctors should be aware about the various medico-legal issues which help in proper recording of medical management details. Aim: To evaluate the knowledge on Medico-legal Issues among Medical and Dental College Health Professionals of Meenakshi University (MAHER), Tamilnadu. Materials & Method: A cross-sectional survey was conducted among health professionals of Meenakshi University (MAHER), Tamilnadu. A total o f320 health professionals (163 medical and 157 dental) participated in the study. A structured, closed ended, self-administered questionnaire was used for collection of data. Chi-square test was used to compare the awareness of medico-legal issues between medical and dental health professionals. Results: Among the 320 health professionals, 87.4% of medical and 76.1% of dental professionals were aware about the informed consent, 18.8% of medical and 5.7% of dental professionals had awareness about COPRA and only 14.3% of medical and 7.6% of dental professionals had awareness regarding the Medico-legal programs/courses. Conclusions: The results illustrated that the participants had little awareness on medico-legal issues. Hence there is an urgent need to update the understanding of these issues to be on a legally safer side. Background: As computers and internet usage is increasing rapidly in all fields more so with health care systems, an immediate attention on the computer knowledge and its application is needed for health professionals. Aim: To assess the knowledge of computer technology and their attitude towards its usage among health care students in an institution located in India. Materials & Method: A cross-sectional questionnaire based survey was conducted among dental, medical House surgeons (interns) and final year nursing students of Mamata Institutions in Khammam, Andhra Pradesh, India. A pretested closed ended questionnaire was prepared and was distributed. Results: A total of 260 subjects had participated in the study (female=170, male=90). About 42% of the subjects had their own computer or laptop; 84% of the students thought that a separate subject of computers should be added to the curriculum and 87% of the students thought that computers were necessary to manage patients' information. Conclusions: There is a need to improve the health care students' knowledge on computer education and application of this knowledge in to their clinical practice. Objective: To identify similarities and differences in oral health attitudes, behavior and values among 1 st year dental students studying in two dental colleges of Chennai city. Materials & Method: The study was carried out in two dental colleges of Chennai city among 120 first year dental students aged 18-19 years. They were grouped under different zones (north, East, South and West) and those who responded to the self-administered questionnaire were included in the study. An 18 item closed ended questionnaire primarily associated with oral health attitude, behaviour and tooth brushing was used. This questionnaire is a modified version of the Hiroshima University Dental Behavior Inventory (HU-DBI). Results: About 64% of the study subjects agreed that they were worried about visiting the dentist; 73.3% of the study subjects were concerned about the color of their teeth; the students from south and north were more concerned compared to the people from east. Significant differences (p<0.05) were seen among students of different zones regarding not worrying much about visiting the dentist, about bleeding gums while brushing, worrying about having a bad breath and the thought that it was impossible to prevent gum disease with tooth brushing alone. 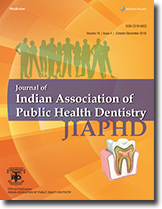 Conclusions: Statistically significant differences in the oral health attitude/behavior were recorded among 120 first year dental students from the two dental colleges in Chennai city yielding plausible results, using the HU-DBI. Oral health education needs to be provided in those areas where there are deficits in knowledge. Objectives: To assess the Knowledge and Practice regarding Oral Health among the Rural Government Primary school teachers of Mangalore, Karnataka, India. Materials & Method: A self administered close ended questionnaire consisting of 15 items was distributed among the rural primary school teachers of Mangalore (n= 165). Comparison of knowledge and practice amongst the three age groups was done with Kruskal Wallis test. Comparison of mean scores between the genders was done using Mann-Whitney-U test. Comparison of mean scores across four educational qualification groups was done using Kruskal Wallis test. Results: Significant difference (p< 0.01) was found across the three age groups for the mean practice scores. There was significant difference between the genders with females scoring better for the mean knowledge, practice and the total scores. Conclusions: Oral health knowledge was lacking among the primary school teachers of rural Mangalore, although practices were satisfactory. Oral health education program targeting only the teachers is of utmost importance in the light of the present study results. Background: The most serious dental injuries are avulsion of a tooth in children. Avulsion of permanent teeth accounts for approximately 0.5%-16% of dental trauma. The prognosis of replanted tooth mainly related to the injury of the periodontal membrane during the time the tooth is out of its socket. Dry storage of tooth will result in an irreversible injury to periodontal membrane with the result that the replanted tooth will be lost over a period of time. Objectives: To assess the present knowledge level of tooth avulsion among school children in Nalgonda. Materials & Method: A cross sectional questionnaire study was carried out on primary and secondary school children of Nalgonda, aged 7 -1 4 years. A total of 500 children were randomly selected from both government and private schools. A close-ended, pretested and self administered questionnaire which was written in local language was distributed. The questionnaire contained 10 questions pertaining to tooth avulsion. Results: Aboutl 8.8% of the children had experienced dental trauma in the past, Many children knew that a tooth could be knocked out but few (14.4%) had knowledge that same tooth could be replanted.48.3% said that washing tooth was necessary before reimplantation and majority (83.1%) said that they had not received any advice on tooth avulsion management. Conclusions: Overall assessment of the children showed a low level of knowledge regarding tooth avulsion and replantation principle. There is need for comprehensive dental educational programmes and oral health promotion amongst school children to improve their knowledge on tooth avulsion and replantation. Background: It is estimated that in India one million deaths occur due to tobacco every year. If left unchecked, it is projected that the mortality due to tobacco consumption will rise to 1.5 million by 2020. Objectives: To assess the knowledge, awareness, chewing practices and adverse effects of tobacco as risk factor for oral cancer among unskilled workers in Yenepoya University. Materials & Method: A cross sectional study was conducted among the unskilled workers in Yenepoya University. A pretested self administered questionnaire was used to record the response regarding knowledge, awareness and adverse effects of tobacco chewing practices among the subjects. The data collected were tabulated and subjected to statistical analysis, Cronbach a was used to assess internal consistency. Results: The study population consisted of 280 unskilled workers in Yenepoya University. Among them 169(60.4%) consumed tobacco; 155(91.7%) people consuming tobacco were aware of the harmful effects of tobacco consumption and 14(8.3%) were unaware; 162(95.3%) workers were aware of oral cancer and 7(4.7%) workers didnothave knowledge about oral cancer. Conclusions: Even though the study population were aware of harmful effects of tobacco and oral cancer, the prevalence of tobacco usage was found to be high. Background: Worldwide tobacco is the leading cause of preventable death. Anew treatment in smoking cessation and relapse prevention is nicotine vaccination which is based on active immunization against the nicotine molecule. This article aimed to review the mechanism of action, current status of research and future aspects for the development of vaccines against nicotine. Materials & Method: The literature search of publications indexed was carried out in PubMed, Medline, Google scholar databases. Total 25 animal trials, human trials under various phases of clinical trials, unpublished document and cross-sectional survey were reviewed. Results: This immunization will act on immune system to produce nicotine-specific antibodies that sequester nicotine in the blood stream, after inhaling tobacco products. Nicotine vaccines are irreversible, provide protection over years and need booster injections. Efficiency of the vaccines is directly related to the antibody levels which help to optimize the vaccine effect. Nicotine vaccines are today in an advanced stage of clinical evaluation trials. Conclusions: Though, nicotine vaccine has considerable therapeutic potential, they do not target the non pharmacological factors that maintain tobacco dependence. So combination of nicotine vaccine with behavioral interventions would be effective mode to motivate abstinence from tobacco use. Dentists and dental students often assume awkward physical positions while providing treatment to (a) get a better view of the intraoral cavity; (b) provide a more comfortable position for the patient; and/or (c) operate equipment and reach for instruments and supplies. Posture isn't the only concern. New technologies and changes aims to give the dentist new concepts to give greater comfort and better health. This review emphasizes on a new technology: proprioceptive derivation concept.Proprioceptive derivation concept helps dentists to discover new ways of positioning themselves, and working comfortably and effectively, which makes it possible for dentists to adopt a more neutral, less awkward working posture.